Traffic studies show the project will generate a moderate increase in daily trips that is well within capacity of the roadways. 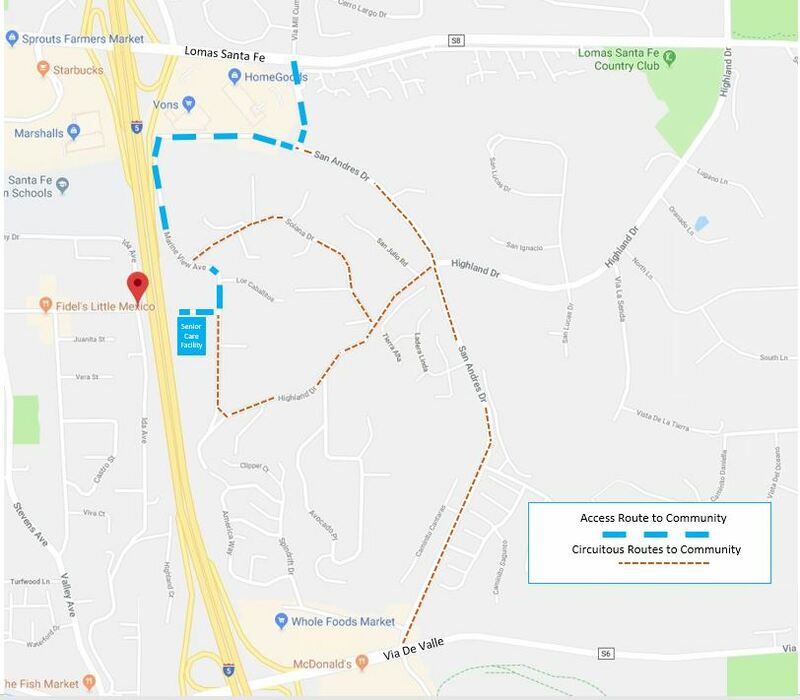 It is important to note that most residents will not drive at all and will have their modest transportation needs met by a shuttle. Most trips will be made by employees, whose shifts will be staggered throughout the day and scheduled to avoid rush hours and drop-off/pick-up times at schools. The facility’s operator will encourage employees to use public transit and provide a shuttle from bus stops and the train station. Deliveries are expected to include two to four trips per week for food and supplies in city trucks (not 18-wheelers). Trash pickup and FedEx/UPS deliveries will coincide with those already occurring in the neighborhood. Moderate traffic from visitors will be dispersed across daytime and evening hours seven days a week. Most employees, visitors and deliveries will gain access to the facility by way of San Andres Drive and Marine View Avenue the shortest and easiest route to the community for most. 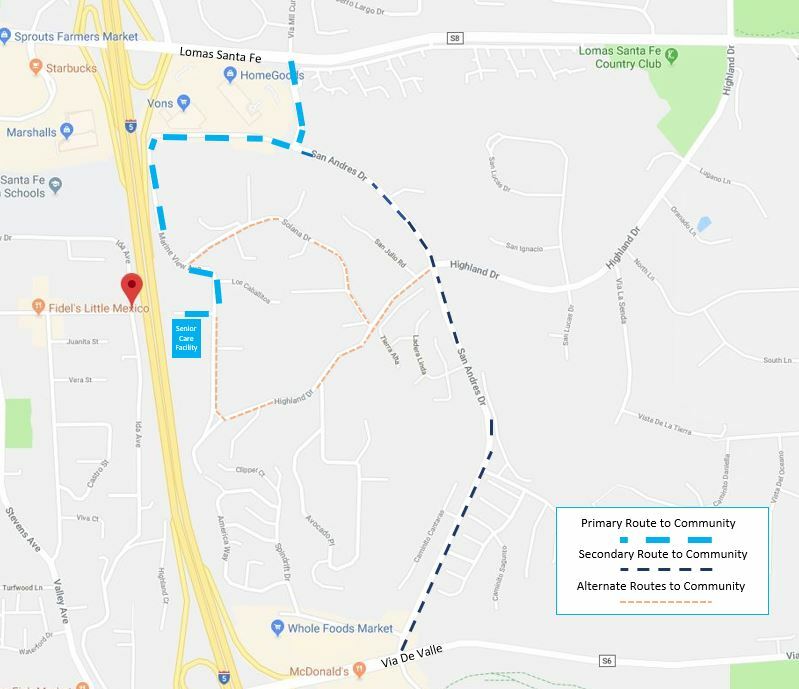 Motorists would travel about 600 feet on Marine View Avenue from Solana Drive before turning onto Genevieve Street to enter the facility. This stretch of Marine View has one curve -- and clear visibility. Marine View is 24 feet wide on this stretch with curbs on both sides. . A pedestrian path runs along the west side of the road. The lane widths, at 12 feet, are the same as those of most freeways. Note that CA regulations limit the width of vehicles (that includes semi-trucks) to 8.5 feet. Trucks and cars can easily pass one another. It may seem that the roadway appears to be narrow and that is good as it helps to calm traffic and slow speeds down. The facility is planned for drop-offs, deliveries and most parking on the west side of the building and out of view of the neighborhood. 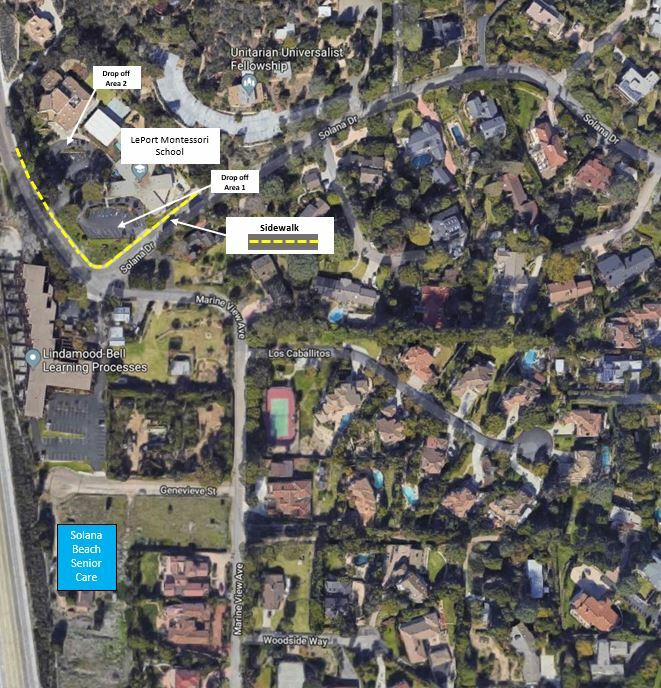 There are some minor improvements planned for Marine View including a rolled curb and DG pathway along the property frontage and new paving and a sidewalk along the Genevieve frontage. These improvements were kept to a minimum as early discussions with nearby neighbors indicated that they wanted to maintain the rural feel of the street and traffic engineers did not identify any safety issues. 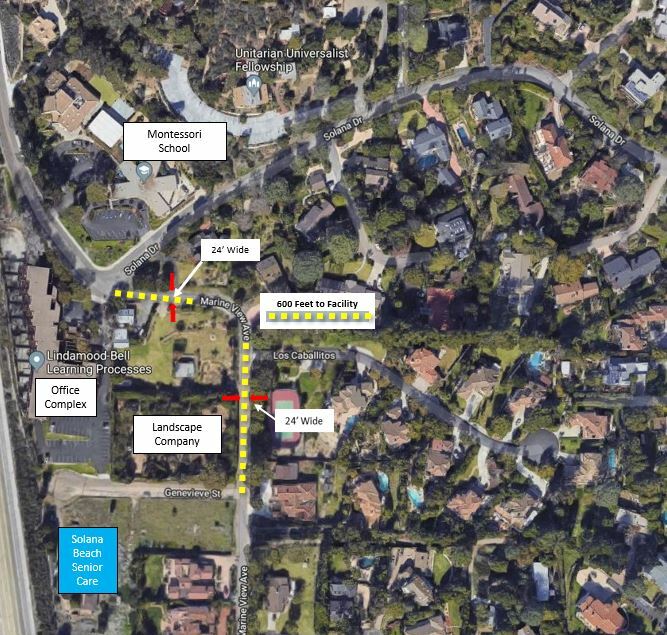 There is plenty of road right of way along Marine View from Genevieve to Solana Drive for addition of a sidewalk on the east and north sides if the City determines that is needed. Based on more recent neighborhood concerns it will be easy to add a sidewalk there. In general, seniors require a greater number of emergency calls for falls and other medical emergencies. However, seniors who reside in care facilities require fewer calls for service because living quarters and shared spaces are designed to prevent falls. The facilities also are staffed with professionals who are trained to triage issues and reduce calls for emergency service. Based on surveys of calls for emergency service at La Vida Del Mar -- a local assisted-living community with about 110 residents –and information provided by operators of about 100 similar facilities, Solana Beach Senior Care would place between 1.5 to 2.5 ambulance calls per week. For such calls, emergency responders generally enter residential neighborhoods without sirens. Emergency responders will have no trouble reaching the facility quickly and safely. 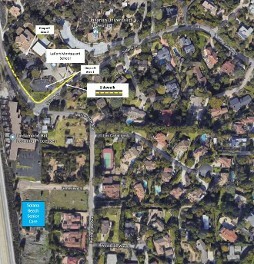 One small Montessori School operates north of the project site on Marine View Avenue. The school serves about 30 students in kindergarten through sixth grades. Most of the students do not live in the immediate neighborhood and are driven to and from school by their parents. The school provides two off-street drop-off areas and a wide sidewalk along its entire street frontage. 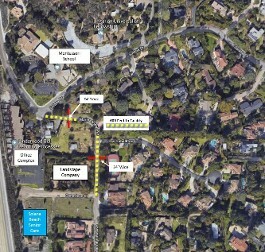 Most traffic associated with Solana Beach Senior Care would not coincide with the school’s drop-off and pick-up times. In the event of a wildfire or similar emergency, residents would shelter in place. As a state-licensed facility, the building is designed with extra fire and safety features. In the unlikely event of an evacuation, the staff is trained to transfer residents onto buses reserved for this effort. The facility would require 4 to 5 buses to transport all residents and staff. The buses would not interfere with the evacuation of 34 single family homes in the neighborhood. Evacuation and safety planning are taken very seriously and are a condition of the facility’s licensing. The Solana Beach Senior Care operator, Frontier Management, has had direct experience in responding to natural disasters and safely evacuated residents at two facilities recently affected by a hurricane in Houston, Tex., and a wildfire in Santa Rosa, Calif.
Access route to facility covers major streets built for commercial vehicles. A typical motorist would not choose circuitous route.